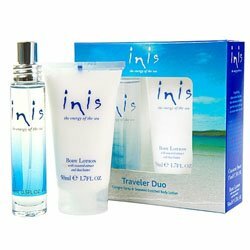 Inis the Energy of the Sea Cologne, Lotion, Soap, Bath Gel & Home Fragrance | P.C. Fallon Co.
Fresh, clean and energizing, Inis captures the energy of the sea. Pronounced, "inish" and named for the Irish word for island, Inis was inspired by the wildly beautiful and untamed seas off the coast of the Emerald Isle. This unique fragrance is a memorable signature scent that appeals to both men and women. The top notes are refreshing lemon and marine, the heart notes are lily of the valley, and base notes are sandalwood and a bit of clove. All Inis products are made with care in Ireland. Experience wonderful spa-quality Cologne, Soap, Body Scrub, Shower Gel, Body Lotion and Hand Cream, all with restorative ingredients from the ocean including hand-harvested seaweed extracts and sea minerals. Now available: home fragrance in Scented Candle and Fragrance Diffuser, each in an appealing frosted glass vessel. Inis is committed to conservation of the ocean, and is the core funder of the Irish Whale and Dolphin Group (IWDG), dedicated to the protection, conservation and better understanding of whales and dolphins in Irish waters and around the world. Their mission is to help ensure that the seas of the world will be a source of delight and joy for many generations to come.